Guests who book a select MSC Cruises 2012-2013 Caribbean sailing online on Cyber Monday will receive special fares and up to a $200 shipboard credit. “Cyber Monday Sale” rates on select 7-night roundtrip Caribbean sailings of MSC Poesia from Fort Lauderdale begin at $399 for an interior stateroom, $619 for an ocean view, $819 for a balcony and $1,269 for a suite. In addition, residents of the United States and Canada who book interior and oceanview staterooms will receive $25 per person (maximum of $50 per stateroom) in shipboard credits; balcony staterooms receive $50 per person (maximum of $100 per stateroom) and suites receive $100 per person (maximum of $200 per stateroom). “Cyber Monday Sale” rates can only be booked online on Monday, Nov. 26. All cruise-only rates are non-refundable, per person, double occupancy; government fees and taxes are additional for each guest. MSC Poesia features 2 pools, 4 hot tubs, a 12,000 sq ft. Balinese-inspired spa and fitness center, four restaurants (including Sushi Bar and authentic pizzeria), 12 bars and lounges, outdoor cinema and much more. On each sailing, guests can enjoy the line’s renowned white-gloved service, elegant and pristine décor, delicious cuisine (including regional Mediterranean specialties) and highly acclaimed world-class entertainment. 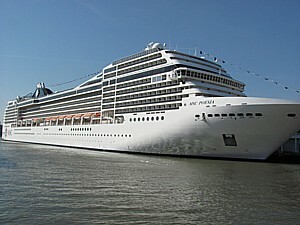 MSC Cruises is a privately-held, family-owned, Italian cruise line with a fleet of 12 ships: MSC Magnifica, MSC Splendida, MSC Fantasia, MSC Poesia, MSC Orchestra, MSC Musica, MSC Sinfonia, MSC Armonia, MSC Opera, MSC Lirica and MSC Melody. Its 12th ship, MSC Divina, a sister ship to MSC Fantasia and MSC Splendida, debuted in May 2012, with sister ship MSC Preziosa scheduled to join the fleet in March 2013. The fleet cruises year round in the Mediterranean and seasonally in Northern Europe, the Atlantic Ocean, the Caribbean, South America, the Indian Ocean, and South and West Africa. For more information about MSC Cruises, visit us online at www.msccruisesusa.com, call 877-665-4655, or contact a local travel professional and ask for the “Cyber Monday Sale” promotion.